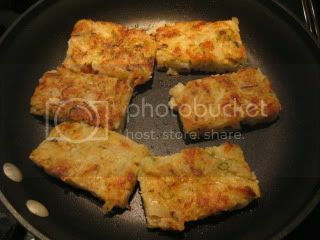 Pan-fried daikon cake is one of my favorite dim-sum dishes, and I love the crusty outside and very chewy interior texture of the cake. But, sometimes I wish the cake was made a little lighter, as this dish tends to be quite filling on its own. So, I came up with a lighter version of this dish. Instead of a heavy load of rice flour, I use just a few tablespoons of whole wheat flour. 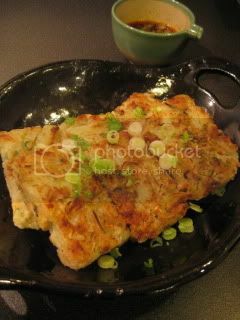 In fact, it's more like a Japanese "Okonomiyaki" style, because I used okonomiyaki flour and mountain yam powder! 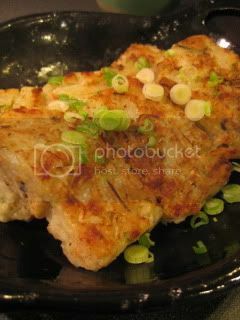 The addition of the mountain yam powder helped the texture to become nicely chewy inside while keeping the dish light. 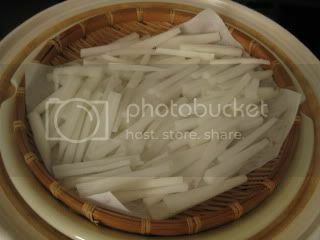 But, this addition is optional and you can still make the nice Daikon Cakes! The key to dish is to pre-cook the daikon by steaming in the donabe steamer, "Mushi Nabe", then steam the batter in the donabe again before pan-frying. It's really good. 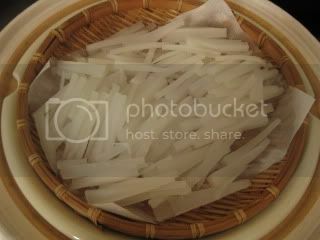 Steamed daikon retains all the nutrients and pure "sweet" flavor, so it results in the really flavorful daikon cakes. 1. 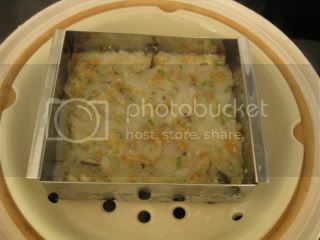 Get donabe steamer Mushi Nabe ready, and spread the daikon on the grate. Cover and steam over medium-high heat for 15 minutes or until the daikon is very tender. 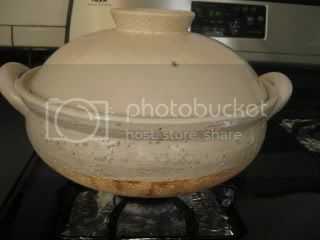 Remove the daikon from the donabe and let it cool down. 2. 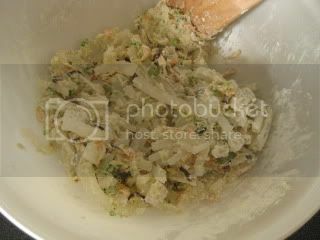 In a bowl, combine the daikon and next 8 ingredients until mixed through by a wooden spatula. 3. 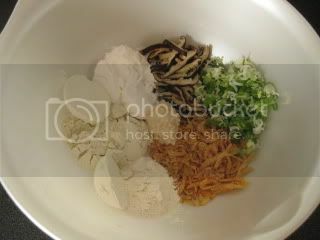 Transfer the mixture into a square mold and set it in Mushi Nabe. Cover and steam over medium-high heat for 15 minutes. Once it's cooled down. 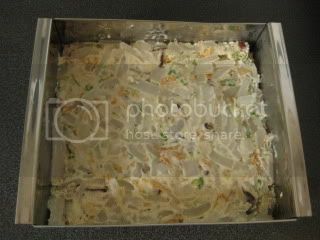 Refrigerate the steamed cake for at least one hour. 4. Slice the cake into your desired size pieces and pan-fry both sides in sesame oil in a sauté pan until golden brown.